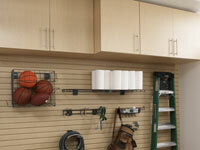 Manufacture & Supplier of Storage Systems in South California. 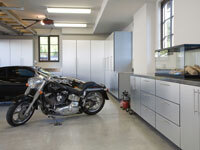 Affordable Garage Storage Solutions designed to suit your premises and pocket. 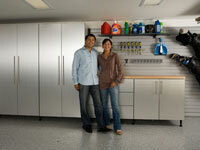 For too many homeowners the garage has always been associated with clutter, disorganization and stress. Without a quality, comprehensive solution available to attack the mess, homeowners have had no choice but to suffer. Until now. Garage Envy created a comprehensive storage solution designed solely for the garage, starting with our storage systems, cabinetry and workbenches. The quality begins with the construction of our cabinets: We use one-inch thick industrial grade material to increase the weight capacity of our cabinets and shelves. This allows our customers to load our deep cabinets with the heavy, bulky items commonly found in the garage, including dog food, fertilizer bags, and even extra furniture. What's more, each cabinet has a solid back to ensure structural integrity and to allow cabinets to be mounted to blemished drywall, open studs or solid block walls. Attractive, solid stainless-steel handles. 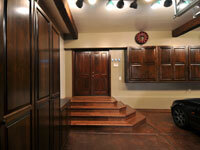 They're standard on all cabinets, offering strength and functionality. 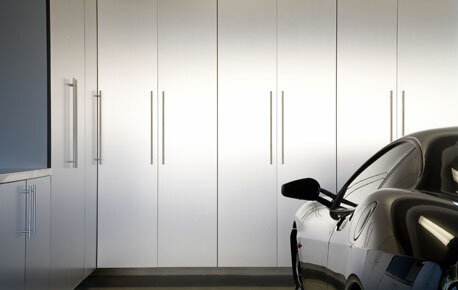 Hinges that are six-way adjustable with 110 degree swing and concealed euro-design.